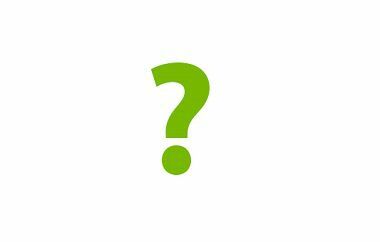 Find the most frequently asked questions concerning the application process as well as the Green Talents programme at a glance. Please schedule sufficient time to compile the required documents and be aware that all documents have to be in English. No other language can be accepted. If your question cannot be answered here, feel free to contact us. » How can I apply? » Can we apply as a team? » What is in it for me? » Which research facilities will be visited during the Science Forum? » What is required from me during the application process? » Who are the experts I should nominate in my application? » What does the funding include? No exceptions to these requirements can be accepted. Ineligible applications will automatically be disqualified. The Green Talents Competition focuses on outstanding young scientists who are active in the field of sustainable development. The German Federal Ministry of Education and Research (BMBF) fosters interdisciplinary approaches in this regard. This year's competition is held under the banner "Smart Green Planet – Solutions for a Sustainable Future". Applicants can therefore come from any scientific field closely related to sustainability research. Applications can only be submitted via an online tool. Documents that are sent to us by email cannot be accepted. Please note that applications cannot be changed once they have been submitted nor can any missing document be handed in after the deadline. This programme is directed at and looking for outstanding individuals with exceptional characters. We look at an individual's research potential and their passion for what they do and where we think this might take them some day. Luckily, everyone is different and it is this uniqueness that we want to cherish. It is therefore not possible to apply as a team. In addition it is not only about what you do now but also about what your aspirations are for the future. This is why we do not fund projects but aim to foster individual development. 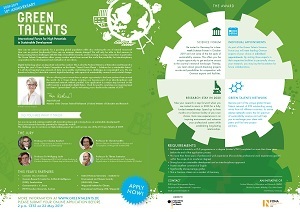 The prestigious Green Talents programme offers you the unique opportunity to become part of an exceptional world-wide network of outstanding young minds and leading German institutions. The first part of the prize consists of an invitation to a two-week Science Forum in Germany, where you will be introduced to renowned research facilities and have individual meetings with experts (individual appointments). Here you will learn about potential collaborations and experience the country’s excellent research infrastructure at close hand. In addition, a workshop on research and funding opportunities will provide you with further information for your future research stay in Germany. The journey will culminate within a festive award ceremony hosted by a high-level representative from the BMBF. You will have the opportunity to return to Germany for up to three months to conduct a research stay at an institute of your choice the year after the Science Forum. Learn more about how the Green Talents story continues for the awardees when they return to Germany for their research stays. The Science Forum and the extended research stay will be fully-financed by the BMBF. Which research facilities will be visited during the Science Forum? The research facilities that are visited as part of the Science Forum change every year in order to demonstrate the broad scope of the German research environment. We try to create a mix of research institutes, universities and companies and also to include Germany's major research organisations, namely the Fraunhofer Society, Helmholtz Association, Max Planck Society and Leibniz Association. You can find a complete list of all facilities that have been visited up until now and are therefore part of the Green Talents network here: Science Forum. The "stations" that will be visited during the two-week Science Forum are 5-6 pre-selected institutions, which all 25 Green Talents winners will visit as a group. Details regarding the latest facilities can be found here. What is required from me during the application process? You first need to make sure that you meet the mandatory requirements in order to apply for the Green Talents Competition. Applications can only be submitted via an online tool. This will guide you through the application process. Please note that the application will take some time. However, you can take a break and save the information you have completed and continue at a later stage. The selection will be based on an applicants’ achievements in the field of sustainable development and their specific interest in cooperating with German partners. How is your research/work related to sustainability science in Germany? Please also indicate which of the institutions in this year’s Science Forum are most relevant to you and why. Questions regarding your scientific qualification. We kindly ask to uplaod your latest FINAL graduation certificate as well as your latest course record. Full academic transcripts are required, because they convey important information such as specifics about the composition of the study programme, credit requirements and student performance. If you have only recently started a post-graduate study programme (Master or PhD), please upload your graduation certificate as well as a confirmation of matriculation. Questions regarding your publications and patents. You are not asked to hand in full articles. We merely require a list of books/chapters/articles you (co-)authored. Therefore please complete the Excel template you find during the application process and list your publications in chronological order, naming the titles, potential co-authors, the publisher and the context (book/chapter/article/conference paper etc.). Please note that one letter of recommendation is totally sufficient, but you are free to upload up to three. Your application is incomplete and cannot be processed without this document. However, we are well aware that despite it being common practice for individuals being assessed to be handed a reference letter in Europe, this may not be the case in other countries. If your assessor refuses to give you a letter of recommendation, please upload a Word document with his/her name and complete your application. The assessor should then send us a letter via email to greentalents@dlr.de, stating your name and application ID number. We will add the letter to your documents. Important: the letter must reach us before the deadline. Otherwise your application will be incomplete and therefore disqualified. It is mandatory to indicate the level of your English skills and to add an English language certificate to your application. For example, this can be a certificate from a language examination (TOEFL, IELTS etc. ), a certificate from language classes you have taken or confirmation from your university that your courses are taught in English. As a native speaker, please simply fill out and attach the selfdeclaration of proficiency in English signed by yourself, indicating your full proficiency. Who are the experts I should nominate in my application? When applying to the Green Talents Competition, you will be asked to name German experts (mandatory requirement) you would like to meet during the Science Forum if you are selected (see individual appointments). These experts must be based in Germany but neither do they have to work at any of the institutions we will visit nor be a member of the jury. You can nominate someone of your choice but you should bear in mind that the individual appointments are intended to help you find a host for your research stay the following year. You should therefore consider someone from your own field of expertise and start to think about what you would potentially discuss with them. The three appointments will be completely organised by the Green Talents team. Please don't contact any expert yourself. When selected as a “Green Talent”, your chosen interlocutors will be contacted by the organisers of the Science Forum, who will provide information about you, arrange meetings and plan accommodation and transport for the participants. Unfortunately, we cannot always guarantee that the nominated persons will be available. Therefore, we kindly ask you to list five experts you would like to meet. Please also refrain from contacting the experts at any point prior to your appointment unless this has been previously communicated with us. We have put together some information that may prove to be of use if you are facing difficulties in identifying a German expert. On the basis of their scientific excellence and innovative research potentials a high-ranking jury of German experts from academia and industry selects the 25 “Green Talents” from numerous applicants. Due to the large number of applications submitted every year, the assessment and selection process is very complex and takes until mid-August each year. Please understand that we cannot provide you with any information about the selection until the jury makes its final decision. All applicants will be informed of the results in due course. We will cover the round trip to Germany and back to your country of residence and also provide a monthly allowance when you return for your research stay the year after the Science Forum. This allowance is intended to support you during your stay and will be sufficient for accommodation, insurance, food and your daily needs. However, it is not intended to support your research. The research stay must commence in the year after the Science Forum and should last between a minimum of 4 weeks and a maximum of 12 weeks. It is not possible to conduct the research stay at two different organisations/institutions/companies or to split the time of the stay. Generally, all research facilities in Germany associated with sustainability research are eligible for funding. The awardees need to choose the host by themselves and obtain official confirmation of supervision from the host organisation. In addition, a research plan that has been coordinated with the host is required before funding for the research stay can be granted. After the stay, the participants have to submit a report, summarising the key results of their work during this period as well as an outlook on future collaborations.